I was born in Montevideo into a Jewish home in 1988. I started my formal training by studying Graphic Design at ORT University where I obtained a BA. Prior to going freelance, I worked for five years in a couple of design studios where I discovered my enthusiasm for editorial and brand design. I became interested in visual language since I was a child thanks to my mother who, when she wasn’t working she dedicated her time to paint. Somehow it struck me that she signed her paintings so I also started to sign my drawings. This was my first approach to type as I designed my signature by taking my mother’s signature as a reference. Later, in school, I was the one making the posters for the different activities that we were doing, like dancings and halloween parties. As I grew I knew that I wanted to spent my days doing posters as I enjoyed the exercise of putting type and image together. Then, my parents entrusted me the design of their logo for their real estate company. This action deeply marked me and gave me confidence in myself, but more importantly it ignited my love for design. Other family members started asking me for logos and advertising posters for their projects after seeing the work I have done for my parents. This is what made me decide to professionalize myself as a graphic designer, something I didn’t know it exist. I consider myself a modernist, but what is modernism? This adjective has been used through time from bauhaus era, to mid-century American design to Swiss International Style, this means that the definition of modernism changes according to time. For me modernism is about designing for the future without any yearning about the past to achieve a timeless design. To achieve a timeless design an intelligent and attractive abstraction of an idea is a must where geometry will be the main resource and where trends should be avoided. There are three different processes of design, first by sketching with pen and paper, second by sketching on the computer and third by using the mind and imagination. These three processes could happen in a same job or not. I perceive that the most practical way is to sketch with pen and paper. Having a notebook with me allows me to open my mind, feel creative and distil an idea into a visual solution in any place, at any time. When I buy a pair of trousers, I even check to see if it will fit in the pocket. Sketching also allows me to dig deeper. You never know what will inspire you, you jump from one idea to the next one of which could spark the very concept you are looking for. You also need to be mentally prepared to face a blank page. Shall I disturb its whiteness with a stroke of my pen? Will it ruin the purity or will it help the page to have more personality? I don’t have a preferred tool when I sketch, I like to try and change the instrument I’m using. Different pens produce different strokes or writing speeds, for example. This game of playing with pens has significant consequences: I see it as an advantage that helps me produce richer, more versatile ideas when I'm looking for a concept. Regarding to my clients I would like to share a question that I was asked once: do I want to be a designer or an businessman? I thought for a moment and answered, both. This question made me understand that in order for design jobs to become real, it is necessary to understand and let the client know that design isn’t just an asset but an investment. What are my main accomplishments? There are two projects that I would like to mention, the first one is a personal project that is being carried out now, an exhibition of social posters. 8 years ago I started designing social posters being the first one for the massive earthquake that hit Japan in 2010. Last year I realized that the social posters worked to promote different subjects that are present in the Human Rights agenda, but time made them decontextualized, so I decided to unite them under an exhibition. This made the posters able to continue functioning as a communication channel today. 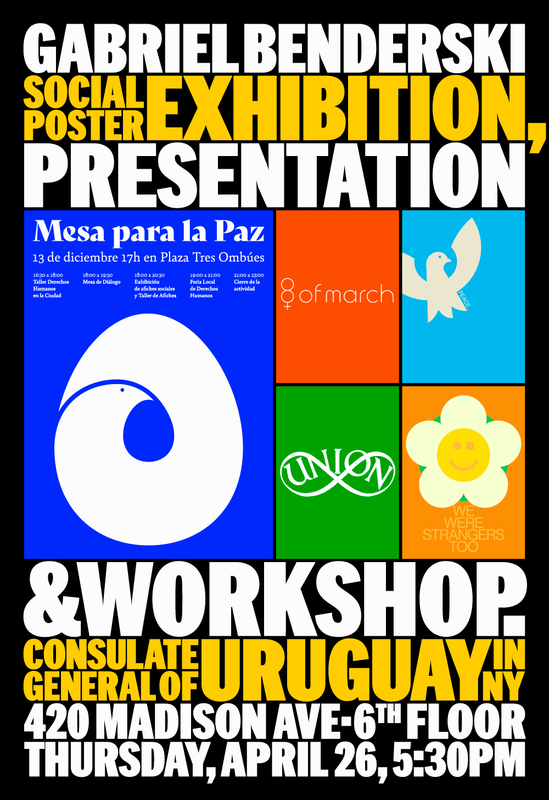 The exhibition was held in four cities around Uruguay and on April the exhibition visited the Consulate of Uruguay in New York. This activity was declared of educational interest by the Uruguayan Ministry of Education & Culture and is part of the National Plan for Human Rights Education. The other project that I will like to share is the identity and wayfinding design for the new FIFA stadium of Club Atlético Peñarol, the oldest and biggest football team of Uruguay. The project was developed with Fabian and Santiago Bicco and it was the longest one in which I had ever worked, more than 9 months with many meetings between the designers and the Board. The design of a stadium is an immense responsibility in which we as designers had the opportunity to not only design for the client, but somehow we were the client as the three of us are fans of Peñarol. What are the passions, inspirations, influences, mentors, people and ideas that have inﬂuenced me? The list is big, but if I have to make a short I would say: Alan Fletcher, George Lois, Herb Lubalin, Ivan Chermayeff, Josef Müller-Brockmann, Jurriaan Schrofer and Stefan Kanchev. But if I have to make the list even shorter I will say that The Vignelli’s, their understanding of simplicity is unique. The way they designed as well as the way they spoke about design. People trend to speak with complicated words to explain something in order to look more qualified, but with them is the complete opposite, they would talked about something complicated and explained in simple and ordinary words. The Vignelli’s love for design is one of a kind, they worked hard not only for their clients, they even created a school of design to promote their approach and to educate the future generations of designers. They fought against ugliness while they were with us and they still does it today thanks to his legacy. Also, there is a special person that I have to mention and that is Fabián Bicco, the work of a designer is usually not a one person job and I have been working with Fabián for 8 years. He is the main person that I have shared my growth as a professional and he is an essential part of what I’m today. What were the biggest challenges I had to face? The hardest challenge will always be to overcome myself. For that I ask myself a pretty old question ‘to be or not to be’. Do I want to be what I'm imagining for myself? Do I want to be a better designer that I was yesterday? Do I want to be a leader designer for my community? Do I want to feel pleased with my portfolio? Three things are needed to overcome yourself and be successful as Massimo once said: vision, courage and determination. So how I developed this three things? By working hard and showing up. Hard work will give me confidence on my skills as a designer and showing up will help me to exchange thoughts to understand how the future will be shaped. What were the biggest disappointments and hardships? The biggest disappointment occurred in 2015 when I couldn’t find a right job. Days and even months passed and I couldn’t find a job as the designer that I had in mind, so I decided that was better to work in something not related to design. Every day I asked myself what I had done wrong, why this was happening to me, I had a degree as a designer and couldn’t work as it. They were nine long months in which I had to stand. Sometimes life is hard, but when you look back you realize how absurd it is, the job that got me out of the most demoralized job I ever had was the best job I could ever have imagined, designing a stadium for the team I’m a fan. What are my thoughts on the industry? and what are the main changes I see, like and dislike? One of the biggest problems in the design industry is the lack of diversity. Design leadership and conference speakers for example remain completely disproportionately white and male. A diverse design community will add more cultural benefits. If designers came from a wider range of backgrounds we will design exactly for that. We trend to assume that the final user is somebody that behave just like us, that is a lie. A wider range will open the spectrum of how we are designing, we are working for the world and for that we need to have a team as diverse as possible. How a team of all similar people will accomplish to create something for such a diverse environment we are living? We also need to focus on what is usable and not what is cool or trendy, not everything that shines is gold. Something that I find in young designers is that they don’t read theory of design as the only focus on making something beautiful that wouldn't last long. I would like to mention two books, the first one is the Vignelli Canon, a free pdf that can be downloaded from this link. There you would find a clear understanding on how design should be approached, even if you don’t share the perspective of The Vignelli’s. The other book is Norman Potter’s What Is a Designer. A straightforward reading that answers many question that we as designers ask to ourselves as a student or as a professional with a career. I would like to mention what the situation is like in Uruguay since is what my experience allows me. The first graphic design career was created in 1994, it clearly means that having a short background defines our environment. Nowadays we have colleagues with 20 or 10 years of experience who are making a change in the Uruguayan society. This is visible as brands rely on Uruguayan designers to solve problems that a Uruguayan designer would understand better. What are the results, impact, and added value of my design work? Value is a thing of perspective, for example a bottle of water in the middle of the desert has a greater value than a bottle of water in the city. In terms of design, who, what, when, where and why is what matters. When working for the largest private institution of Uruguay as It’s Peñarol, the impact and results are impressive. One is able to see the work in use and valued in all kinds of places, from a flag at the top of the stadium to a sticker on a wheelchair, there is nothing more satisfying for a designer than seeing his work in use. I would also like to mention the impact that the Social Poster Exhibition and workshop has had since I noticed an increase of awareness about Human Rights in the different participating groups. I have also detected a strengthening of their communication skills as it is intended that the workshop participators incorporate knowledge of graphic design emphasizing the visual part that is easily grasped and that allows them to add a new way of expressing their concerns. Then there is the value that one gives to design as work, that is, how valuable is what one does as well as how much our work is worth to the client. I value and love good design, I always attempt to spread what I feel for design because I believe that love for design is contagious. If I had to define what is my intention as a designer I would say that I seek to unite good design with successful design. I don’t know what is going to happen in the near or distant future and this is the most exciting thing, it opens doors of curiosity to do what one proposes. Nothing is guaranteed and the least of all is our future, which is why I focus on my present. The fact that I don't make plans for the future doesn’t mean that I’m not prepared, I affirm that the best way to be ready for the future is to have a solid present.